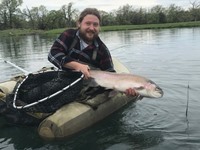 Confluence Outfitters is a group of dedicated fly fishing guides that specializes in the best trout and steelhead rivers in northern California and southern Oregon. Visit our Guide Service page to learn more about our guides and what makes them great. 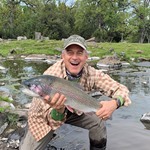 Contact Confluence Outfitters via email or call toll free at 888-481-1650 to book your next fly fishing trip with a Confluence Outfitters Guide. Great Rivers - Great Guides! Lower Sac Float Trips The Lower Sac is our #1 guide destination for good reason. 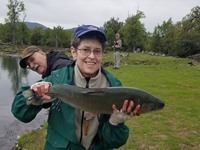 The river has year-round fishing for wild trout and seasonal steelhead opportunities. Lower Sac trout are big and healthy and we typically hook quite a few each day. Nymphing is highly effective but there are dry fly opportunities on many of our trips. Trinity River Float Trips The Trinity River is California's most productive steelhead river. Our guides float the Trinity River in drift boats and rafts. Multiple hookups are common on the Trinity when fishing nymphs under indicators. Prime time is October through February. Klamath River Spey Camps Join us for a 4-day, 3-night camping adventure on the Lower Klamath River. We offer these camps during July and August as fresh steelhead make their way from the ocean into the river. The food, instruction, and fishing are legendary. Fall River Float Trips Fall River is California's finest spring creek destination. Our guides fish Fall River from flat-bottomed prams with gas and electric motors. Fall River fishes very well from May through October. Don't miss the Hex Hatch in June and July! Swing for Trinity Steelhead Nobody does more spey trips on the Trinity than Confluence Outfitters. Our guides know spey inside and out and love guiding spey casters on the Trinity. We offer both raft and walk/wade trips. Prime time is mid-September through December. Pit, McCloud & Upper Sac Ready to wade some pocket water? Walk-wade trips on the Pit River, McCloud River and Upper Sac offer excellent scenery, plenty of exercise and lots of hookups with wild trout. Upper Rogue Float Trips One of our most popular offerings is a drift boat trip for steelhead on the Upper Rogue river. With good fishing September-December and again mid-February to mid-April, this is a great place to catch a steelhead under an indicator or with your spey rod. Battle Creek Private Water We have exclusive access to 3.5 miles of the North Fork of Battle Creek. This stream offers excellent dry fly fishing for wild trout. The trout aren't big, but they rise all day to dry flies. Bring your 3wt! Oregon Coast Steelhead Jet Boat, Raft, and Walk/wade trips for steelhead near Gold Beach, Oregon. This area is known for very large steelhead. We fish this area in January, February, and early March. Eagle Canyon Trout This is our exclusive private water destination. Fish for rainbows from 3 to 15 pounds from shore or float tube. Open from January through April. Today we did a re-run of a trip back in February for a Veteran's First Fly Fishing group from Martinez. They suffered through one of the worst rainy and windy days of the season back in February. I think we made up for it today, though. The weather was a little sprinkly at times but the great overall. The fish were on the bite, too. It was a great way to end our 2018-19 season! Guest Joel sent these photos from April 11th. He said fishing was pretty slow overall, but he and his dad managed to land some nice fish. Redding, California is trout town USA. The Lower Sac runs right through town and a dozen quality destinations are less than 2 hours away. Fall River Mills, California is home to Fall River and a stones throw from the Pit River, Hat Creek and McCloud River. Weaverville, California is our home base for steelheading on the Trinity River. Grants Pass, Oregon is right on the Rogue River, one of our primary steelhead destinations. Gold Beach, Oregon is our home for winter steelhead in January & February.